1. Extremely large protection range - up to 1000 square meters (10,800 square feet). Such an astounding range became possible by virtue of increasing power of transducer and upgraded algorithm of ultrasonic radiation. 2. Triple effect. The device can affect pests by 3 repelling techniques simultaneously: ultrasound, audible sound and bright strobe. Such synergetic effect multiplies the effectiveness of protection. 3. Silent operation. 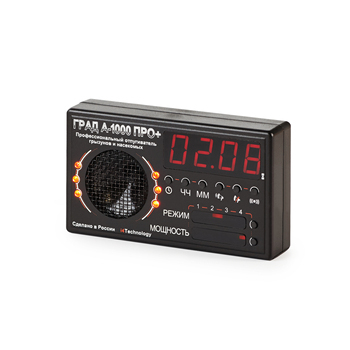 «Grad A-1000 Pro plus» has a separate mode in which the repeller produces no audible sounds! This has to do with the fact that in this mode the repeller only uses ultrasound which is not perceived by human beings. 4. The effectiveness of the device doesn't decrease with time because pests cannot adapt to non-repeating sequence of ultrasound. Laboratory experiments on pests show that prolonged exposure to unaltered frequency gradually loses effect on pests and they stop perceiving it as a signal to escape. 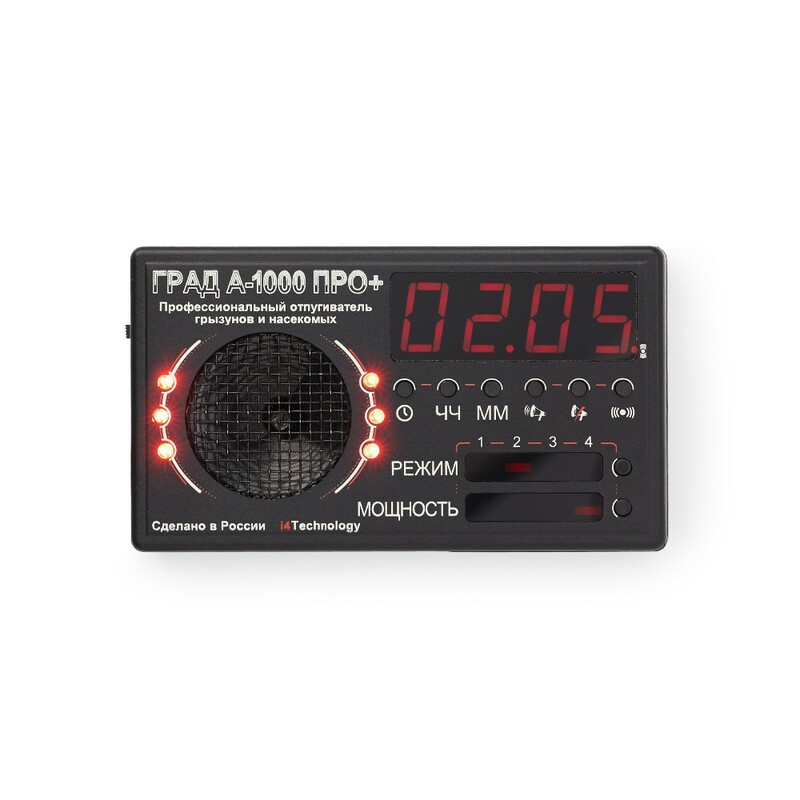 However, «Grad A-1000 Pro plus» uses unique nonrepeating sequence of ultrasound which has no addictive effect for mice and rats. Hence the device will protect your territory for many years. It works without "blind spots" and doesn't reduce effectiveness in zones where pests can hide. 5. 4 modes of operation: 2 modes to repel mice and rats, a mode to repel mosquitos and a mode to repel other insects (fleas, spiders, mites, moths). Such versatility makes «Grad A-1000 Pro plus» the most effective protection device for your household. 6. Ultrasonic emitting power adjustment. This option allows choosing the right level of emitting according to the size of protected compartment. • Level 4 – 100%. • mode 4 - expelling mode for insects (fleas, spiders, mites, moths). Note: mode 3 - ineffective for expelling of mosquitos outdoors, the device should be placed in the window opening. In this way, the number of mosquitoes that flew into a room will be significantly reduced. Note: When the device operates in modes 3 and 4 (expelling of insects), bright flashes are absent as it is known that insects are attracted by light. 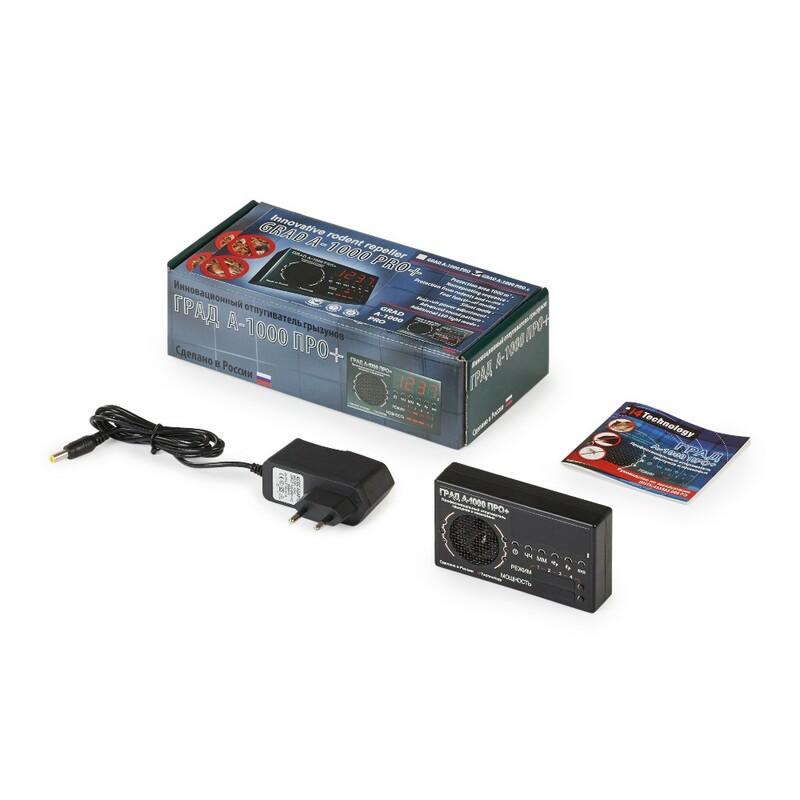 The repeller «Grad A-1000 Pro plus» requires no special pre-operation or settings. It is very simple in use. Maintenance requires only cleaning the surface of the device. The device should be installed in the center of compartment at a height of 60-70 centimeters (23,6 - 27,5 inches) from a floor. Also the device can be placed on a wall.